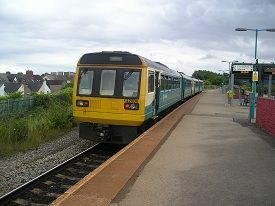 Grangetown is the first station south of Cardiff Central and is built high up above the streets. It is an island station with two platforms and there is a dias type shelter plus several flower beds. I am the only passenger getting on the train, though it is still half full with commuters returning home. We pass the blue Ikea building on the left, followed by the gas works. There are some industrial units on the right and then we speed up and cross the river Taff and go under the A4160. We then pass the remains of some old sidings on the left, which are currently being cleared. There is a large set of luxury apartments by a Marina and then we fork left and start to go on a single line down towards Penarth. We are on an embankment with terraced houses on the right. Then we go into a cutting and soon stop at Dingle Road, which has a single platform, with an aluminium framed shelter. You can see the remains of a second platform on the left as this line was once double track. There are terraced houses on both sides now and we go into a cutting again a soon arrive at Penarth station. It has just the one platform, with a modern looking station building, though I can't see a ticket office or toilets. There is a turquoise liveried bike shed and a car park next to the station.